It's so frustrating to think your making progress only to be found you've lost 3 hundred steps. I'm like that with my blog too, quite the scene to see me try and load a video, still can't get it. Oh hon - sorry the birds flew the coop so to speak!! Loved the post and even the just plain blue - lovely color for June!! Bad birds! Bad, bad birds! They don't appreciate a good thing when they have it! You definitely had me laughing out loud and..... I kinda like the blue! 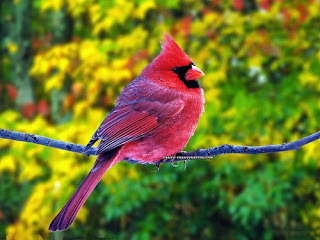 I love the picture of the cardinal. That's my state's bird and I see them all the time and they still make me gasp! Enjoy life because we all end up dead in the end anyway - and I definitely do not mean to sound like doom & gloom here! Don't fret about losing the birds. They'll be back! You are so funny... it's the kind of thin that happens to me too! You made me laugh with your 'oh well!' attitude. That photo is stunning! What an interesting video. I wonder how they put that together. And the bird is beautiful--the one in the photo--NOT your bad, bad birds that flew away. Seriously, though, I do know how frustrating it can be when you finally get something to look the way you wanted it to, but you're not sure how you got it to do so, and then it disappears and you are clueless as to how to recreate it. That has happened to me more than once. I am so sorry---if it makes you feel better I am a backround flunkie myself----one day I lost everything and I thought I will stick to a color---it is just not worth losing everything.....besides I like your robins egg blue backround!